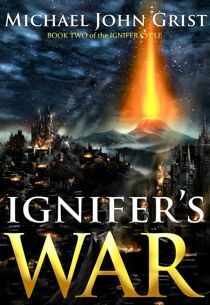 Ignifer’s War is an epic fantasy novel set in a bleak industrial world populated by bizarre castes, where a young man with the fate of the world written in his scars must raise a long-dead legendary army to rescue his swallowed world from the throat of an apocalypse god. The corpse world is destroyed. The Rot is triumphant. Nothing at all is left. But something is. A lone figure watched the apocalypse from the safety of his white room, and now there’s a mysterious figure growing in his wall. With this figure, the fate of all the Corpse Worlds rests. For a war is coming, more massive than any ever waged. Avia’s wildest dreams will be realized one step at a time. New heroes will rise, old heroes will return, and together they will bring the greatest army ever known to battle under Saint Ignifer’s banner, with all the million worlds at stake. Michael John Grist is a 34-year old British writer and ruins photographer who lives in London, UK, after living in Tokyo, Japan for 11 years. He writes dark, surreal fiction in both fantasy and sci-fi genres. If you’ve read the book and would like to review it, I (MJG, author) would hugely appreciate it. Even a few words on one of the sites below (or your own blog/social media) about your favorite bits (i.e.- it doesn’t have to be an essay!) would be very welcome. Thanks!